(ATLANTA) June 13, 2018 – Varec, a petroleum industry innovator and wholly-owned subsidiary of FORTUNE 500® information technology, engineering, and science leader Leidos, is celebrating its 90th anniversary this year. Founded in Los Angeles in 1928, Varec began operations as a metalworking and fabrication shop. A year later, the company entered the oil and gas storage market, helping with the design and construction of some of the first tank farms. Since that time, Varec’s product milestones have helped shape the industry. In the early 1940s, the company developed and launched its iconic 2500 Automatic Tank Gauge (ATG), the first mechanical float and tape gauge on the market. 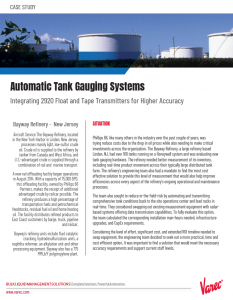 The 2500 ATG has undergone several technology upgrades over the years, but it remains one of the most popular float and tape gauges on the market today due to its reliability and ease of use. In the late 1950s, Varec undertook international expansion in Europe via licensed manufacturers in 17 countries. The 1960s brought the introduction of automation as pulse code systems enabled the transmission of level, temperature, pressure and alarm signals to a centralized control room. By the 1970s, Varec’s level measurement technologies had expanded outside of oil and gas and into bulk liquids in other industries, including food and beverage and water. The company brought their first software package for personal computers and microprocessor based interfaces to the market in 1985. Later, in the mid-1990s, the company launched the first open systems interface device, the 8130 Remote Terminal Unit; developed FuelsManager®, the first SCADA package to be approved by Microsoft® for the Windows NT operating system; and added radar tank gauging devices to its product portfolio. In 1997, the business moved Varec’s corporate offices to Atlanta, GA, where it is based today. Over the past 20 years, Varec has become the fuel management standard for the Defense Logistics Agency (DLA) with FuelsManager installed at over 600 bases worldwide. The company also continues to grow commercially by providing some of the world’s largest oil and gas companies with complete inventory management solutions. 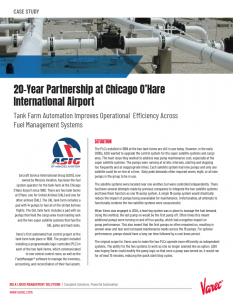 By 2001, had Varec moved into aviation fuels management with tank farm and into-plane solutions at airports such as Hartsfield-Jackson Atlanta, Chicago O’Hare, London Heathrow and more. In 2006, Varec was acquired by Leidos (formerly SAIC), a move that partnered Varec with a parent company closely aligned with its customers’ needs and future vision. Since then, Varec has undergone extensive growth in international defense fuel management solutions and commercial offerings designed to provide complete automation and control at tank farms and terminals. “Varec has a very bright future. We anticipate continued growth and innovation within our current markets and entry into new adjacent ones as we complete technology enhancements already underway,” said Tim Reardon, Leidos Defense & Intelligence President. To coincide with this impressive longevity milestone, Varec has launched a new website and refreshed the company branding. To learn more about Varec, please visit www.varec.com. Varec, Inc., a wholly owned subsidiary of Leidos, is considered the pioneer of inventory tank gauging instrumentation nearly 90 years ago. 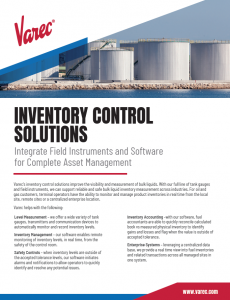 Today, Varec is a worldwide leader in fuels management systems for total asset visibility and control, supplying integrated hardware and software solutions to oil and gas, defense and aviation markets. The Varec FuelsManager suite of product solutions has been a longtime standard of major oil companies and the U.S. Department of Defense, as well as aviation tank farm operators and service providers. With its headquarters and manufacturing facility outside of Atlanta, Georgia, Varec also has offices in Virginia, Australia and the United Kingdom. For more information, visit www.varec.com.